Having recently touted the first-class architecture of 45 Province, among other aspects of this extraordinary property, and the Marino Center at Northeastern, I’d like to turn my attention to the state of contemporary architecture, in general. As an architect-turned-developer, I attended architectural school at a time when it was transitioning from the tail end of formal Beaux Arts training to the advent of Bauhaus, New Brutalism and other contemporary design ideologies that have continued to dominate the design of contemporary building design. With that statement, I am dismissing the work of Frank Gehry which is, at best, a series of tours de force signature buildings, but not a real architectural movement. Frankly, it’s more fashion than architecture, the latter of which must function in the real world, not in an isolated context as is the case with Gehry’s celebrated Guggenheim Museum in Bilbao, Spain. 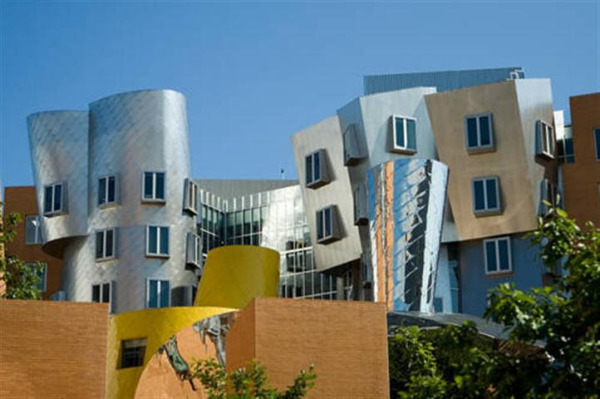 A better example of Gehry’s failings is represented by the Strata Center at MIT, a building that is different for the sake of being different and hardly fits in within its context. I’d hate to live across the street from it, and the photo below is its best view.